Posts tagged with "CARROT Weather"
One of the nerdy features of CARROT Weather I love is its support for personal weather stations as a data source. Not long ago, Federico explained on AppStories that the weather station down the street from him had shut down, so he could no longer use it as a source in CARROT. I suggested he get a Netatmo Personal Weather Station and connect it to Weather Underground’s network of stations, but at about the same time Weather Underground ended its support for the Netatmo device, which left us both without a hyper-local weather source. It wasn’t a huge deal, but there’s something fun about knowing that the temperature you’re seeing in CARROT is the precise temperature outside your window and not some weather station that may be miles away from your home. With today’s update, CARROT has stepped in with direct support for the Netatmo weather station as well as other new data sources. For the Netatmo device, all you need to do is sign in using the same login you use for Netatmo’s dedicated app, and as long as you’re within two miles of your home, CARROT will include the data collected by the Netatmo device. Dark Sky is the default data source for CARROT, but users have three other options. The first is The Weather Channel, which provides the most extended-range forecast (data covering the next 360 hours and 15 days), is available worldwide, and can access personal weather stations connected to the Weather Underground network. CARROT has also added AccuWeather and Aeris Weather as data sources. The Aeris Weather option includes PWSweather.com personal weather station data. 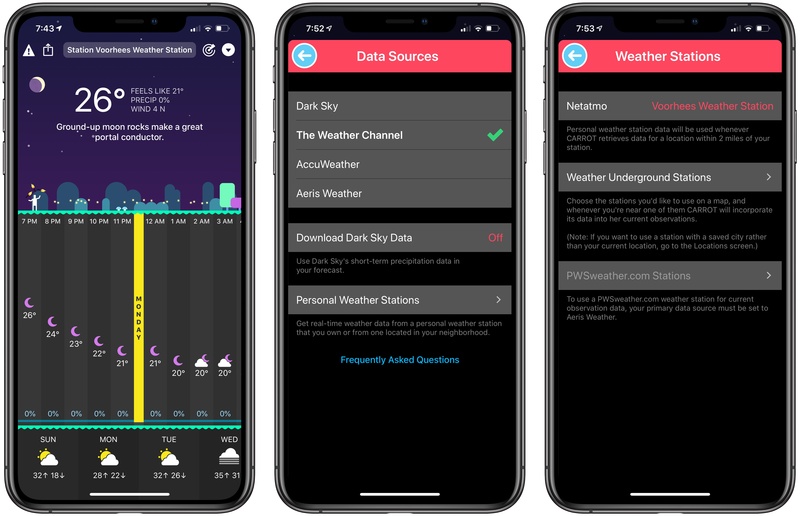 Users have the option of including Dark Sky's short-term precipitation in CARROT even if The Weather Channel, AccuWeather, or Aeris Weather is their data source. Personal weather stations connected to the Weather Underground system and PWSweather.com can be selected from a map allowing you to pick one closest to where you live. Other than the personal weather station access through the Weather Channel’s API though, Weather Underground data, which was previously a data source option in CARROT, has been removed because IBM, which owns Weather Underground, has discontinued its API. The location screen has a new ‘Recent Searches’ section, from which you can add previous searches to your saved locations by tapping the star icon next to them. I’m glad Brian Mueller has expanded the data source options for CARROT Weather. The best source varies depending on where you are, and with more sources, CARROT should be a better option for more users going forward. I especially like the personal weather station integration. Whether you have a weather sensor yourself or want to piggy-back on another publicly-available station nearby, they’re an excellent way to track hyper-local conditions. CARROT Weather is available as a free update to existing users on the App Store. 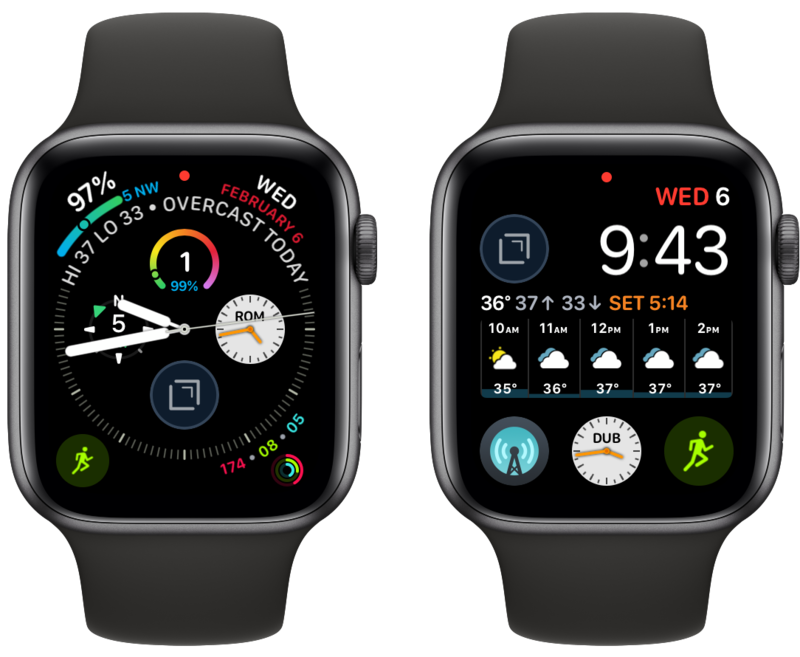 Within a matter of a few months, CARROT Weather has launched a major new version, then followed up with a fun AR mode, and now with version 4.2, it’s adding several key refinements to improve the overall experience. CARROT’s snarky personality is the defining characteristic of the app, yet recent updates have seen that personality gain customization options – both for users wanting more snark, and those begging for less. With today’s update, CARROT goes through perhaps an even more drastic transformation. From the Personality screen in Settings, there are now a variety of new voices that can be set for CARROT, including both female and male options. Among these is FRED, the voice used for the original Mac. My personal favorite is JEEVES, whose smug butler tone makes me feel inferior in a way I thought only the original CARROT could. Users of CARROT Weather’s alternative data source, Weather Underground, get a couple nice updates in this release. Now, available weather stations can be seen and selected from a map view, making it much easier to get the absolute most accurate data for your current location. Also, severe weather alerts are now available for all of Europe so you’ll be kept in the know regarding official hazards. 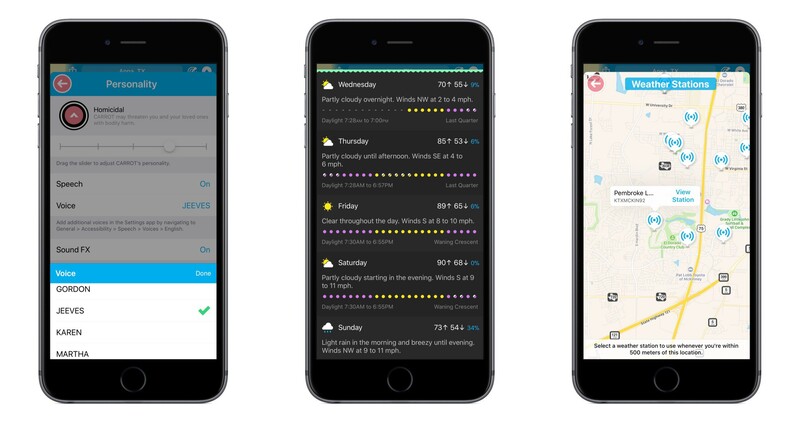 If you prefer your weather app to provide a little more business, a little less party, CARROT’s Professional mode has been enhanced in a couple ways. Not only will the maniacal A.I. be de-snarked when set to Professional, but now the little characters and animals in illustrations will be hidden by default as well, AR mode will present a more civilized CARROT, and secret locations can now be turned on. Premium subscribers have a new vertical view option for daily weather info, which can be accessed from Settings ⇾ iPhone/iPad ⇾ Daily ⇾ Details. I’ve found that I prefer the vertical view over the default horizontal, and I enjoy how it still fits right in with the setting of a landscape – when details slide up from the bottom, it feels like you’re simply delving deeper below the surface. CARROT Weather keeps getting better. The additions in version 4.2 aren’t blockbuster features, but they make for an overall more complete package. 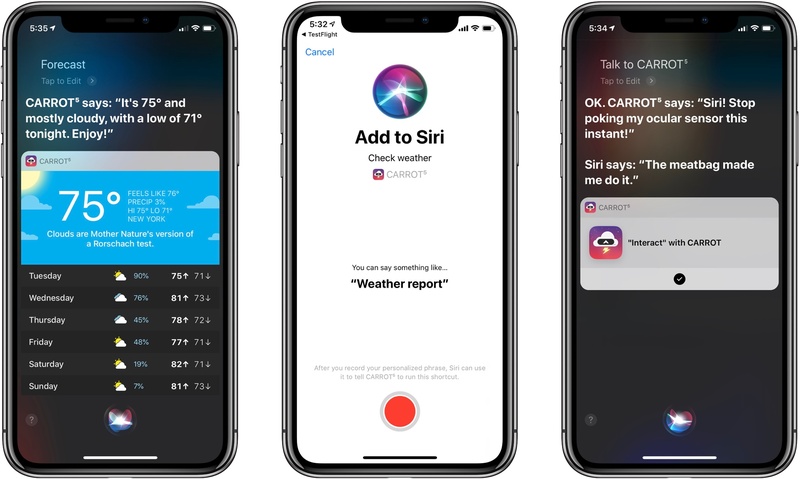 Now users with all kinds of weather and personality preferences can benefit from this top-notch app and customize it to their liking. Without losing its distinct sense of flare, CARROT Weather is quickly becoming a weather app for everyone. CARROT Weather is available on the App Store. 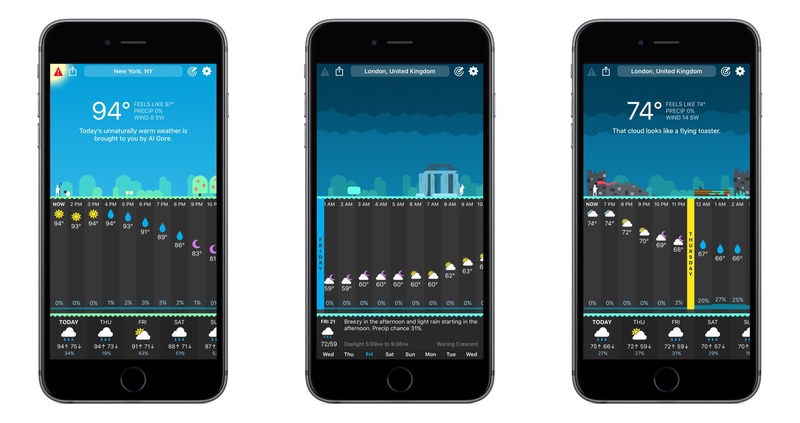 CARROT Weather transcends iOS apps in its category by infusing a full-featured weather app with a personality that makes it a delight to use. 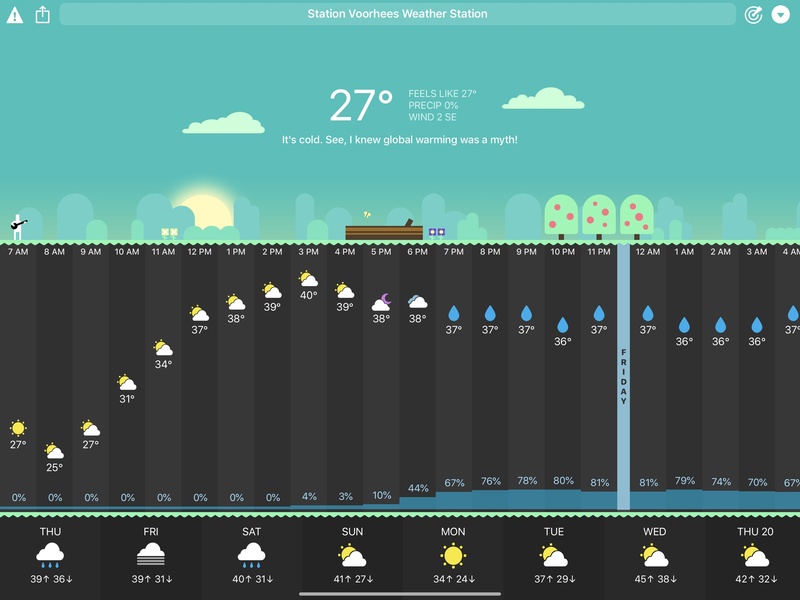 Earlier this summer, CARROT Weather received a major redesign that managed to incorporate all its weather data into a single screen interface without feeling cramped. That’s not an easy task for a highly customizable app. CARROT Weather also has one of the most performant and useful Apple Watch complications available. It’s a combination that’s made the app a MacStories favorite. 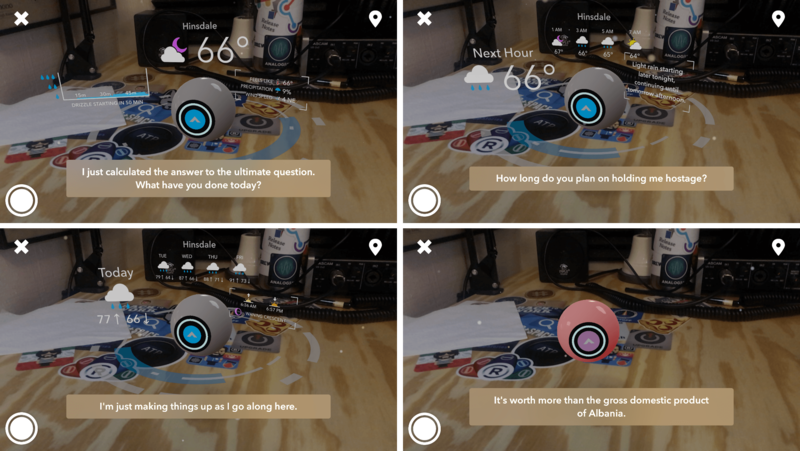 The app's latest update takes advantage of ARKit to bring CARROT, the app’s snarky robotic protagonist to life as never before. Tapping the button in the top right-hand corner of the screen opens a drop-down menu for accessing AR Mode, Time Travel, and Settings. As with other ARKit apps, tapping AR Mode requires a few moments of calibration. When it’s ready to go, the icon projected into your environment turns green. Tap it, and CARROT drops into the scene surrounded by the current weather conditions and other data. Swiping on the ring below CARROT changes the weather data floating around CARROT to the next hour’s forecast and then the long-range forecast. You can pinch and zoom in AR mode to adjust the frame of the scene and move your iOS device around to admire CARROT from different angles, all the while being taunted by its snarky comments. If there's precipitation, that animates in the scene too. I don’t want to spoil the surprise, but try poking CARROT’s ocular sensor. It’s a bit of game-like interaction that makes me smile every time. In addition to AR Mode, CARROT Weather has added Time Travel so you can check the weather up to 20 years ago and the forecast 10 years into the future. There’s also a new dark mode, three new secret locations, and hundreds of new lines of CARROT snark. AR Mode fits perfectly with CARROT Weather’s style. It’s not a way I’ll check the weather most days, but dropping into AR Mode is a fun diversion when you’re not trying to check the weather quickly before running out the door. It’s entertaining and complements CARROT’s personality perfectly, making the app a pleasure to use. The snarkily clever weather app, CARROT Weather, was updated to version 4 today, and with that update comes a full redesign. The core piece of CARROT’s identity – its sarcastic A.I. – is still here, as are the beautiful graphics of past releases, but outside of that a lot has changed. On this week's episode of AppStories, we interviewed Brian Mueller, the creator of the CARROT series of apps, about how he got started, the origins of CARROT, a corgi with a top hat and monocle, and his new CARROT game, Artificial Superintelligence. Setapp – An app for every job, already on you Mac.